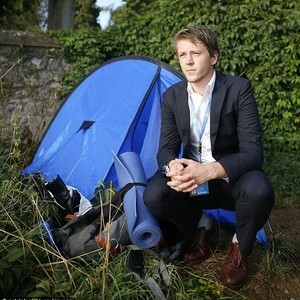 During the sleepiest week of the year, the story has been flooding the press all over Europe and beyond, causing an uproar: a 22-year-old New Zealander, David H., unable to sustain himself during an unpaid internship within the United Nations Secretary, has resolved to give up proper housing and live in a tent hitched up on the grounds overlooking Geneva's lake, somewhere in the city's Botanical Garden. «I am announcing my resignation from the United Nations’ internship program. I want to make it very clear that the UN did not ask me to leave or pressure me to make this decision in any way. It’s my own decision and I chose to resign because I feel that it would be too difficult to continue to focus on my work as an intern at this stage. I just want to make it clear that no person forced me to sleep in a tent, but rather my circumstances and the conditions for this internship made it the only real possibility that I could see. After graduating I began to apply for jobs, but all I could really find was internships. In every interview, the same questions always came up towards the end: can you afford to fully fund yourself for the duration of this internship? When I answered this with an honest “no”, my application was declined. And so when I applied for this role with the UN I did not fully disclose my financial situation. I said I had enough to support myself but I really didn’t, and I got the job. The UN was clear about their internship policy from the start: no wage or stipend, no transport help, no food allowance, no health assistance. I understood this, and in that regard, I have to take responsibility for accepting the internship in the first place. Call me young and call me idealistic but at the same time, as I have expressed earlier, I do not feel that this is a fair system. At this stage I think the focus needs to move away from me. Interns all over the world need to come together and push for the recognition of our value and the equal rights that we deserve. Because, as the Declaration of Human Rights states so clearly, “everyone, without any discrimination, has the right to equal pay for equal work. Everyone who works has the right to just and favourable remuneration” I hope to see the United Nations becoming a role model for all on the issue of internships in the future». Repubblica degli Stagisti, among the contributors to the European Quality Charter on Internships and Apprenticeships, has often spoken about unpaid internships within European organisations and has recently published an article specifically devoted to UN's contradictions [read "The shame of unpaid internships at the United Nations: the interns protest"], drawing on the last advocacy event that took place on July 18th, precisely in Geneva. Here, according to the local Interns Association, the UN and its agencies employed around 160 interns every year, two thirds of whom were unpaid (data 2013). The story of the young intern living in a tent in the sixth most expensive city in the world, understandbly enough, was shocking to most - catching off guard the protagonist's mother herself - and unleashed a stream of solidarity from all over Europe. Repubblica degli Stagisti has verified the story first-hand and has solid ground to hold that the facts are true and the account given in the statement genuine, despite rumors in the online press stating otherwise. It is however expected to report further on the subject, shedding light on elements which it agreed not to disclose for the time being due to privacy concerns. In the meantime, RdS has agreed to sign a joint press release with some of the world's most involved youth organisations (InternsGoPro, the Brussels Interns NGO, Génération Précaire, Interns Australia, Plattform Generation Praktikum) reporting the story and urging «United Nations member states to introduce and adopt a resolution prohibiting unpaid internships at the UN, thus respecting young people’s right to work and to fair pay while enabling the institution to live up to its ideals of equality and human rights». Indeed, as the brave intern's statement pointed out, it is not about a single case - reason why this newpaper, symbolically, chose not to fully mention his name. Focusing on the sensational story, however appetizing for the media (for a couple of days), would be useless, if not actually detrimental to the shared cause. It is, in fact, an excellent opportunity to renew the interns' cause on the EU political agenda. Political action is what is needed and what the organisations are tenaciously pursuing through synergy and joint action. Repubblica degli Stagisti has suggested to start working at a joint call to the UN which would formally request the adoption of fair working conditions for its interns, as anticipated in the press release, and so far feedbacks from fellow activists have been positive. On the other hand InternsGoPro and the European Youth Forum, the platform of EU non-governmental youth organisations, have agreed upon November 10th as being the date for 2015 International Interns Day, which will most likely take place at the European Parliament in Brussel, backed up by simultaneous events in other European cities (brand new Facebook event here and landing page here). The ambitious goal would be to get at least one UN member state to present a resolution to the European Parliament. Time to change, isn't it?